If the plethora of information out there isn’t enough, let me remind you again – sunscreen is your first step in an anti-aging skincare routine and no one is ever too young to wear sunscreen. They even make baby sunscreen these days and there are prices ranges to suit everyone. Which brings us to 2 sunscreens from Biore. These 2 sunscreens in the Aqua Rich range were released some time early this year in 2 formula – Aqua Rich Watery Essence and Aqua Rich Watery Cream Whitening. Both sport SPF50+ PA+++ claims which is about as high as they legitimately go for broad spectrum protection from UVA and UVB rays. Now you know I love my Shiseido Perfect UV Protector sunscreen. I have finished it thanks to my beach holiday and I really like it. However, the price is hefty on the wallet so I was wondering if these two from Biore would be more wallet friendly substitutes. I’ve never tried any Biore ones despite the popularity – these are supposed to be the No. 1 sunscreens in Japan! 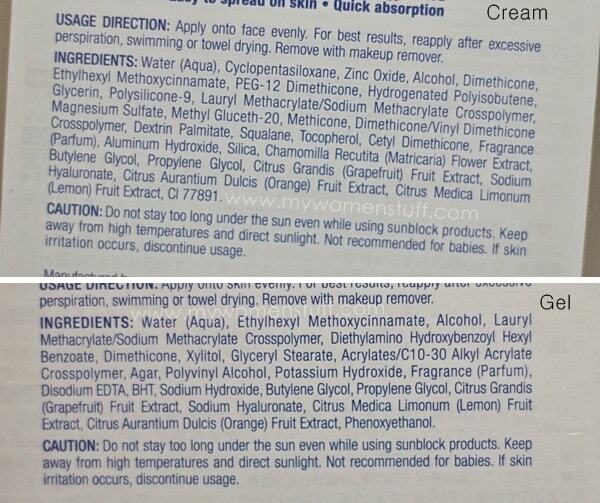 As the names of the product imply, there are different textures in both tubes of sunscreen. This has a very light water-gel texture that is very comfortable on the skin. It is almost like applying a gel moisturizer on your skin – its that light! I find that it leaves a light cooling feel after application and has a light citrus scent tinged with alcohol. Like many Japanese sunscreen formulations, these contain alcohol. Initially, I find that it feels a little sticky but the feeling soon passes and the skin feels comfortable but it does feel like there’s a layer of product on it. It also feels smooth to touch, like a silicone layer. This has a slightly thicker cream texture that is also very easy to apply on the skin and feels comfortable. Unlike the Watery Essence I do not get the initial sticky feeling. I however am put off by the scent in this one. It has a very strong alcohol smell laced with citrus. Believe you me, it is not something my nose likes getting assaulted with early in the morning. Whilst it feels very comfortable on my skin and is not thick or oily or sticky, I find it drying. I know, that is very odd in a product with a name like Aqua Rich and Watery Cream. I liked it initially. I was willing to forgive the scent. But after I used about half the tube, I realised that my skin felt dry and it wasn’t very comfortable. Apparently, there is chamomile extract to suppress melanin production and prevent age spots in this one, hence the “Whitening” label in the name. I personally feel one can’t judge something like this visually so all I’d say is that if it works, great. Oh and I also find that this one leaves a bit of a white cast on my skin. All very little things that just irk me in general so I don’t like the Watery Cream version. 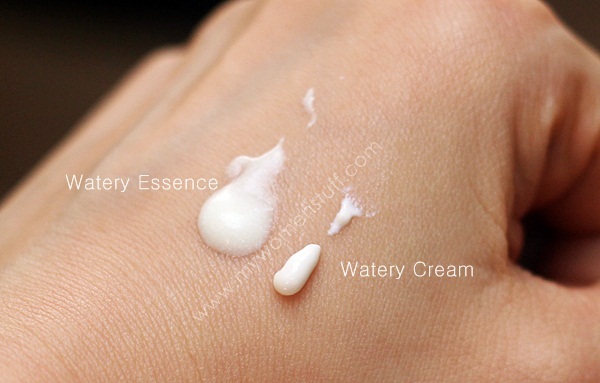 You can see from the swatches that the Watery Essence version is much lighter in texture than the Watery Cream. Both feel light on the skin and if I had to pick one of the two, I’d pick the Watery Essence because the scent is lighter, there is no white cast and it does not dry my skin out. One thing I noted of both of these sunblocks is that they did not seem to protect my skin as well as say, the Shiseido one can. I noticed this because my face would feel warm after a short time in the sun as opposed to when I wear the Shiseido sunscreen, when I do not. In fact, I don’t even feel this uncomfortable when I’m using a sunscreen like La Roche Posay Anthelios or Kiehl’s which I also happen to like despite the heavier texture. When I’m at home I actually find myself reapplying 2-3 times just to avoid this warm feeling. Although it says SPF50+ and PA+++ protection, which is equivalent to that in the Shiseido UV Perfect Protector, I have repurchased the latter despite the price tag, simply because I feel more comfortable with it. 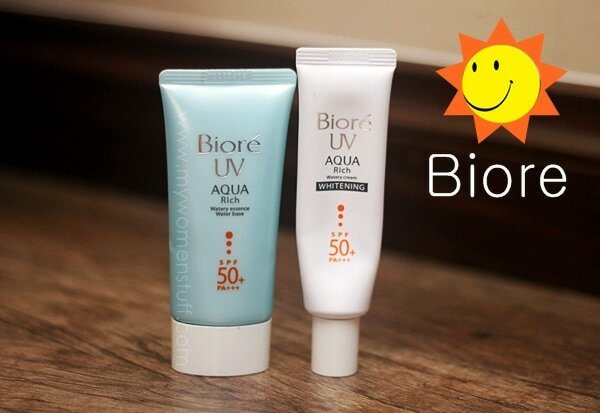 The Biore UV Aqua Rich Watery Essence and Watery Cream Whitening sunscreens contain SPF50+ PA+++ protection against UVA and UVB rays. The Watery Essence has a light gel-water texture which is very light on the skin and absorbs quickly although it starts out with a bit of sticky feel. The scent is light. The Watery Cream Whitening is supposed to help control melanin production as well as protect the skin. The scent is very strong and I feel that it leaves a white cast on my skin and is drying on my skin. I personally do not like the Watery Cream so if forced to choose I’d pick the Watery Essence. I find that my skin burns faster with these than with a comparable SPF sunscreen so I will not repurchase. I know Biore sunscreens get a lot of love from the budget category. Just look it up online and a billion people (almost!) love this brand. Personally I have never tried any before this because the one time I tested it, it gave me a dry papery feel to my hands like Sunplay (awful!). I am quite tolerant of most sunscreen textures, having used heavy oily types and light types with no real preference so long as they do a good job but anything that dries my skin and leaves a papery feel is a no go. Here is the ingredient list for both the Biore UV Aqua Rich Watery Essence and Watery Cream Whiteing for those interested. Are you a fan of Biore sunscreens? Have you tried either of these and have thoughts to share on them? Haha we published similar entries today! I’m not a big fan of the alcohol so I’m still searching for the perfect, not-too-expensive sunscreen. I gave the Cream one to Suan, not sure if she’s already reviewed it yet. Oh my! Synchronicity! 😀 I can usually tolerate alcohol in most skincare (Japanese brands are chockfull of them!) but this one, I just did not like. The smell was so strong! My friends around me was raving about this sunblock especially the water essence. I was quite close to buying them because their price are great especially when Watsons has sale it make them more affordable. Yet I am still sticking with my Hada Labo one as it works great with no mineral and alcohol contents. I guess this is why we differ because our skin works differently. While I am a fan of Japanese sunscreens, and had at one point loved Biore sunscreens, I eventually realise that the alcohol in it is too much, and causes bumps to appear on my skin. I also think it’s kind of oily. But I guess it’s just being sensitive. My favourite one is specifically Sunkiller Kiss Me, which does not smells of alcohol (because many Sunkiller sunscreens do smell like alcohol). Unfortunately, I can no longer find them in Singapore!!! For some reason, I still think Japanese sunscreens are more well-rounded and complete than their Western counterparts. So yay for Biore! I’m using Biore’s sunscreen too but not this range as I don’t like the scent. While testing the product in pharmacy I do like the texture but it doesn’t look suitable for users with oily and combination skin. I actually have not seen Watery Cream Whitening before… In Singapore, what we have is the Biore UV Aqua Rich Watery Mousse which is a different texture from the cream and very light and comfortable. The mousse was very popular with musingsofamuse and lotuspalace. If you can get your hands on it, do try the mousse version. I have heard that the Watery Mousse is very nice and many people have raved about it. I am a little wary about trying another Biore sunscreen now since it doesn’t seem to protect my skin but who knows, maybe I’ll try it some day, thanks for the rec! I like Biore’s UV bright face milk (which is a pink bottle). it comes in blue and white bottles and I like them all. it is easy to spread and doesn’t feel sticky. Oh I think I remember that one – you have to shake it up right? I see that around a lot too! Seriously, why don’t we have Biore down here even at Watsons???? WHY???? Goodness! You don’t get Biore?! I thought it was everywhere. Thanks for the review! I was just thinking of picking up the Watery essence after I use up my small size of Allie sunscreen, so it’s good to know what you didn’t like about it. That’s interesting about the warm feeling – I guess that’s a sign that the sun is hitting our skin cells? It feels good but if it means skin damage I’m going to avoid it! I’d used the Biore UV Aqua Rich Watery Mousse one last year and quite liked it – it has that citrus scent that you mentioned but I guess I’m not as sensitive. However, I thought that the small tube wasn’t very good value. I hate that dry papery feeling too! It seems to be the default texture among Japanese sunscreens, so I have to be really careful about which ones I try. I guess I’m picky about texture because I don’t like sticky feelings either. I’ll check out the hada labo emulsion. I love the Aqua Rich Watery Essence. 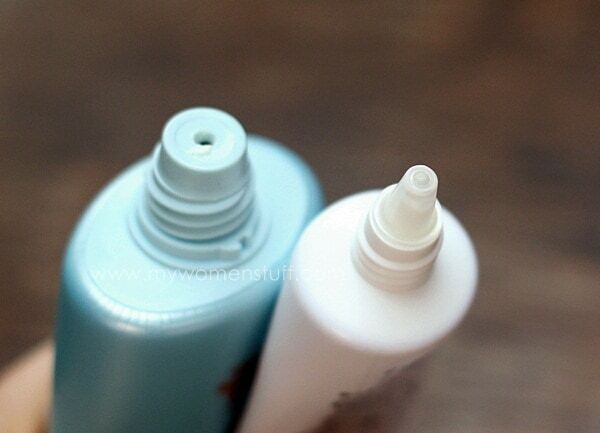 Could not even tell it’s a sunscreen by its texture and smooths the skin like a primer too! Score! I don’t like these either. My skin felt dehidrated after using them. I still prefer Sofina Jenne spf50+PA+++ and Shiseido Anessa (the golden version, for super protection). Ah, I guess not everyone loves these sunscreens after all! 😉 Thanks for sharing your faves, Renata! I haven’t tried the Shiseido Anessa one yet but I know it gets a lot of raves too! i do love the watery essence so! i brought this along to Bangkok and had no problems with it. Didn’t quite like the whitening cream version because it feels too thick and when I tried the watery essence, the mousse version just didn’t feel as light anymore. I also love the Perfect Face Milk too! I haven’t tried Biore…I would really love to try Institut Esthederm, I know some people swear by it! I’ve been using the second tube of Biore UV Aqua Rich Watery Essence now and love it. Initially, I thought it’s gonna break me up but it didn’t after the first few weeks using it and now, I’m stuck to this UV protector! Because of oily skin, I am really having the hardest time to get used to sunscreens or sunscreen containing moisturizers. They are usually very thick and oily and sticky and white and all gooey and all that (you feel the love? lol!). But if all this blog reading thought me something, that is not to judge anything and not to keep close mind to a brand and/or product simply because it didn’t work for me before! I know it is wrong, and I know this because I am a chemist who works in a pharmaceutical company and working on clinical studies about oncological products, but I never used sunscreen either summer or winter. But I noticed that since last year I am having the hardest time to turn to my usual skin tone in winter time after tanning at summer. So this summer, I searched a bit about tinted moisturizers containing spf and I bought a bb cream of Clinique’s which contains spf 35 and doesn’t make my face oilier than usual. And you always mention in your blog to try new sunscreens, that scientists work on them and develop them to work on every kind of skin, so I went to Sephora last week and bought Clarins’ UV Plus stuff.. And I love it!! So to make a long story short (too late ha?!) thank you very much for encouraging me and all the others like who don’t use sunscreen for similar reasons to go out and try!! Oh yes I gave it a go yesterday. We were gonna be out in the sun whole day so I used this onto my moisturizer and I never felt the burning feel on me even at noon! But when we returned home, the water was gone and I couldn’t wash my face and around midnight I felt rashing on my face and I had a few whiteheads this morning on my cheeks which made me feel very bad 🙁 I know products with sunscreen properties should be washed properly (mostly with oil cleansers) but the whiteheads gave me the creeps..
LOL! That would be a tragedy, Becca! Are there any Asian drugstores around your area that might stock it? I have read that some places do carry these in Chinatown or the like.